Anyone else love the TV show “Chuck”? About the lovable nerd who gets a bunch of government secrets embedded into his brain and has to help the CIA and NSA on a bunch of missions? Mustaches are horrible, horrible things. 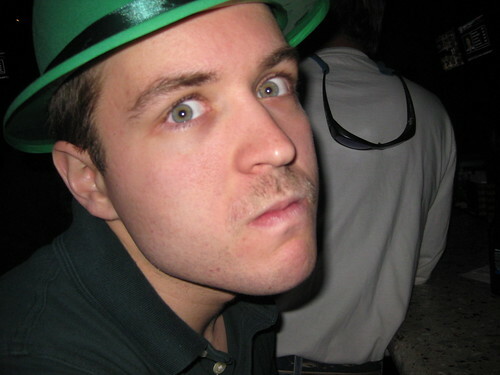 A tradition among power school students is to start growing a mustache at the 4400 point mark. This is the point where a person only needs to pass the final exam (Comp) to pass power school by reaching the required 5000 points. I passed that mark last week, and I haven’t shaved my upper lip since. My face is itchy and I want to shave it off, because I look ridiculous. But, I must remain strong and see it through; you are allowed to shave it after you have passed Comp. We have 3 more finals before that exam, the hardest is this Friday. I’m definitely not looking forward to it, nor the study hours I’m going to be putting in the next two days. I’m home to work out a little today, and then heading back to school, something I’m definitely not looking forward to. Other than that, I haven’t been up to much, aside from moving and all the craziness related to that. It’s been stressful, but has actually relieved a lot of stress for me in some ways. I’m enjoying our new place, and overall I’m totally glad we moved. Sorry I haven’t updated more often, I promise to make an effort to remind myself to write at least a little something here every once and a while. Josh and I are going to participate in a 4-hour spin and fund raising marathon at our gym (Eco Fitness) on March 7. All money raised will be donated to the Pattison’s Academy. They are a rehabilitation meets education organization for children with severe and multiple disabilities. We are looking to our friends and family to help us reach (and hopefully exceed) our goal. We have set our goal at $150 each. We encourage everyone, even if it’s just $5, to donate to this cause. All donations for our ride can be sent through PayPal using the button on the right. If you don’t have PayPal, don’t worry. You can still use the donate button. Just scroll down and under “Don’t Have a PayPal Account?” click the Continue button to use a credit card or bank account. To make it more interesting for you, Josh and I will email you some exclusive images (and maybe a video!) after the ride. 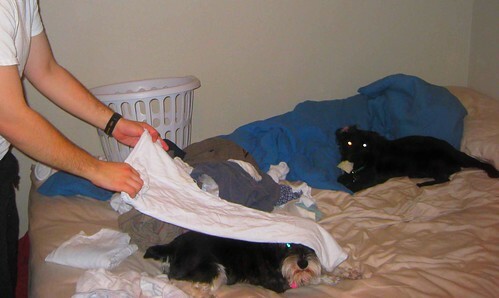 Josh was folding the laundry on the bed and Boomer insisted on helping. There’s just one problem, Boomer makes a terrible table.